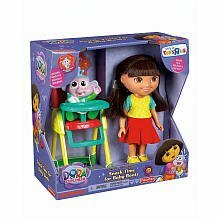 It's snack time for Baby Boots,"prepare"him a snack with the Fisher-Price Dora the Explorer Snack Time for Baby Boots Playset. Sit Boots on his highchair, so he doesnt make a mess! 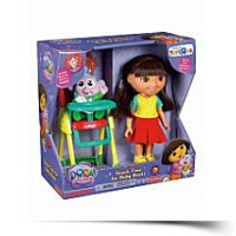 The Fisher-Price Dora the Explorer Snack Time for Baby Boots Playset comes with Dora and Baby Boots figure along with a high chair. Includes snack time adventure storybook.